Britain's supermarket landscape has undergone sweeping change on Monday as Morrisons completes its £3bn ($5.2bn) takeover of rival grocer Safeway. The move brings to a end one of the most keenly contested UK acquisition struggles in recent years. Bradford-based Morrisons sparked a bid battle for Safeway last year after launching a £2.9bn offer for the firm. It claimed victory after the government ruled against rival supermarket group bids on competition concerns. 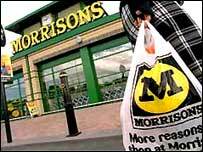 In mid-morning trade on the London Stock Exchange, shares in Morrisons were down 0.5 pence at 248.5 pence. Britain's big three supermarket chains - Tesco, Asda and Sainsbury's - all made counter offers for Safeway, along with billionaire retail entrepreneur Philip Green. Morrisons' takeover of Safeway - which will give the grocer a bigger slice of the market in southern England - increases the pressure on Sainsbury's for third place in the UK supermarket rankings. The enlarged group will operate more than 550 stores, and plans are already in place to rebrand many of the larger Safeway stores as Morrisons. The group is also considering converting nearly 180 medium size Safeway stores into a "Morrisons Compact" brand, to challenge the likes of Tesco and Sainsburys which operate smaller branded town centre outlets. Unlike Morrisons' original offer, the revised deal comes with a cash element - 60p per share - designed to appease stockholders disappointed that the original bid was made entirely in shares. Family-run Morrisons expects to achieve annual cost savings of some £215m from the takeover, compared with an earlier estimate of £250m. South American mining group Antofagasta has taken Safeway's place in the FTSE 100 Index.